WordPress 3.0 is coming out with an interesting feature – Multisite. This allows us to create multiple sites with single WordPress install, each site can has its own plugins, themes and content. This article will show you how to enable multisite in WordPress 3.0 and how to work with it. Now, go to Dashboard, under the Tools menu, you’ll see a new menu item: Network. Just enter the Network Title, Admin Email Address and press Install button. WordPress has 2 options for installing: install network using subdomain or sub-directories. Because I’m installing WordPress on localhost, so WordPress automatically detects that and choose sub-directories for me. 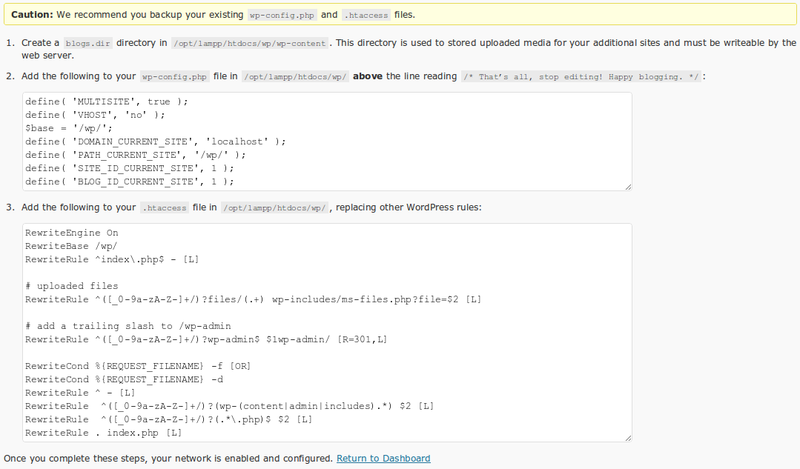 After that, WordPress requires you to insert some lines into wp-config.php and .htaccess files. Once you complete adding these lines, click on the link Return to Dashboard. You’ll be redirected to the login page, just re-login. In Super Admin menu, you can create new users, sites as well as manage themes, plugins on sub-sites. We’ll see it in details on next sections. In the normal Dashboard menu, there’s a new item: My Sites. Click on this, you’ll see a list of sites that you’re a member (note that one user can participate in multiple sites). Click on the Sites item on the Super Admin menu, a new page appears that allows you to see existing sites and create new site. To add a new site, enter its address (in this situation, we use sub-directories), title and admin email, then click on Add Site. Note: if the admin email is duplicated with some user’s email, then this user will be the admin of new site, otherwise, a new user is created. Once new site is created, you can visit it via new address (for example: http://localhost/wp/test). It looks like a normal WordPress blog. Go back to Sites menu, when you move mouse over a site name, you can see some actions for the site: Edit, Backend, Deactivate, Archive, Spam, Delete and Visit. The Deactivate, Spam, Delete and Visit are clear by theirs name, so I will go in detail for Edit, Backend and Archive. site options (a big list of options), including site’s description, email settings, post and date format, thumbnail, comment and widget settings, etc. This will overload the site’s options that set inside its own backend Settings page. site themes: which themes are available for this site? The Backend link allows you to login to the created site. You’ll be redirected to the login page. Remember to use the account you created for this site to login. After logging in, you’ll see a normal Dashboard for the site, here you can add new posts, edit posts, change themes or do whatever you want. The Archive link will make the site unavailable, but it’s still in the database. When you try to access to the site, you’ll get an error message says that the site is archived or suspended. The difference between user manage management in Super Admin menu and normal users management is that the super admin can see all users of all sites in the network here. If you try to edit user information, you’ll see new option for user role: you can make the user has no role for current site or grant the user super admin privileges for the Network. It’s important to remember that an user can participate in many sites. 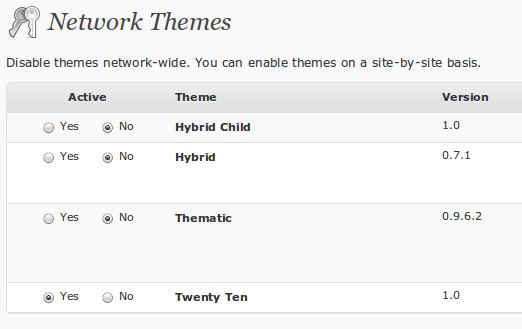 Click on the Themes item of the Super Admin menu, you’ll see all available themes for the network. Each site on the network can use only themes that are enabled here. Check the themes you want your users can use for their sites. This menu is simple and very clear. Operational Settings: The network name and network admin address. The Global Terms is still not meaningful for me, so I leave it Disable (by default). Dashboard Settings: if you want logged in users are redirected to specified dashboard of some site, just enter the its name in Dashboard Site, otherwise leave it blank to use default dashboard. The Admin Notice Feed is used to display some news on all dashboards, just enter some RSS link here. Registration Settings: allow/disallow user and site registration. There’s an option to allow site’s admin to add users to his site via Users → Add New menu. You also can ban some special usernames, domain (for site registration) and email. New Site Settings: you can change the email template when an user register a new site (if he is allowed), and the email template for new user registration. 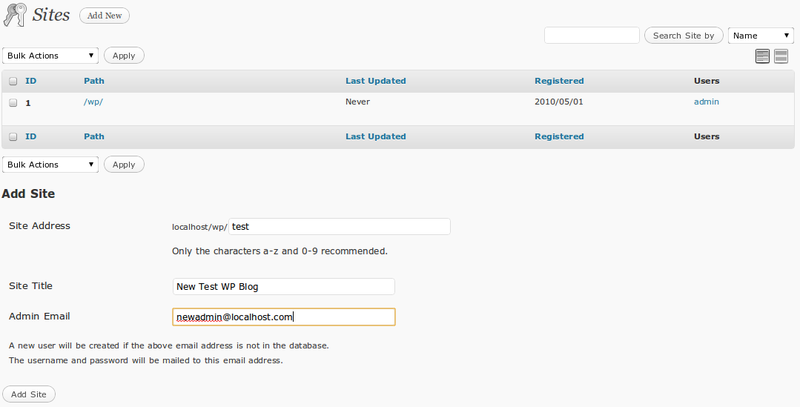 For new site registration, you can also create template for the first post, comment, author, etc. Upload Settings: mange upload file types and size, upload space for storage. Menu Settings: if you allow registered site’s admin to have privilege to install plugins, you can enable Plugins menu here. When you’ve done all of these settings, you can enjoy your network now. The multisite feature is one of the coolest thing in WordPress 3.0. It makes WordPresss looks a bit like WordPressMU: users can create, control their own sites. The multisite feature is being developed, and I hope in the next official build, it will have more options, more control for super admin as well as sites’ users. I wonder with WordPress 3.0, are they going to stop making WordPress MU? Seems pointless now. Yes, WordPress MU will be discontinued. Will it be easy/possible to import blogs that we have already created ? For each site, we can import/export normally using menu Tools. But there’s no tools for importing/exporting all the network settings until now. Would it be possible to have multiple wordpress site, on the same hosting account, but all with their own domain name, not sub-domains/sub-directories?? – as long as you use the domain mapping plugin. Works in 3.0 as well. 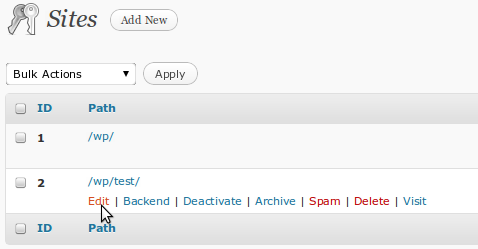 Is it possible to export from WordPress MU to WordPress 3.0? It’s still impossible until now. But WP team are working on import/export features of WP, so we can hope in the official release this will be done. You won’t need to export from WPMU to WordPress, all you’ll do is upgrade to 3.0. Very nice news :). Thank you very much. I currently have two wordpress installations. http://www.blava.org and gremlin.blava.org I have upgraded the http://www.blava.org to 3.0 and enabled multi-site subdomains. Do you have any suggestions on the best way to go about importing the gremlin.blava.org blog into the 3.0 multisite installation? I think you can upgrade gremlin.blava.org to 3.0 and export it, then import it to http://www.blava.org. Thanks… I got stuff going in about 15 minutes. I love WordPress. What am i doing wrong, any idea ? Nice article. Thank you very much. Thanks for the step-by-step guide. I am pondering whether I should implement this feature on my personal site, so I have been playing around with it on my test site using the subdomain method/option! Upload music, video, photos, images, files, pdf, zip… to Multiple Sites in One Shot! You can upload to Megaupload, DepositFiles, FileFactory, NetLoad, UploadedTo, SendSpace, Badongo, Easy Share, Loadto, MegaShare, 2Shared and HotFile Works well. Recommended. hi, what about the plug ins? How do i limit the plug ins for my users? is not supported. And my article describes how to manage it. You can disable the Plugins menu for sites on the network. And if you can then select plugins that you want to be used only and “Network activate” them. Great , Thanks , Bookmarked as a reference. but I cannot see the “Super Admin” link. I have chosen subdirectory. Hi, this post is a little old. In current version of WP, you’ll see an admin menu, which has an item name “My Sites”. That’s similar to “Super Admin” link in this post. How can I enable users using my main site to make a new site from the main site itself. I have a multi site and I could add a new site from the dashboard. But I want users to open a new fixed page and use it after some kind of regestration from my main site. I have followed these steps and created a new multi site , but while opening the new site dashboard i am getting object not found error , please help me on that.